The ice sheet at TD Bank Sports Center is considered some of the best ice in the country by an ice expert. The Chronicle takes you behind the scenes and tells you how the ice is maintained, from the preseason painting to in-game incidents. It’s 6 a.m. when Glen Gerrity starts his typical day shift. The TD Bank Sports Center is empty. He walks into the hockey rink and down to the corner by the Zamboni doors. He first checks the depth levels and temperature of the ice. There are 23 sensors in the ice: three at center ice, three on each blue line, two in each faceoff circle and three on each goal line (including one in the crease). In the ceiling, there are infrared sensors that point down at the ice and transmit data into a computer. There are two sensors underneath the ice to provide the temperature of the thick concrete slab. Gerrity takes a depth meter, puts it in each point in the ice and then logs the information. Ideally, the ice needs to be between an inch and an inch and a quarter for hockey. If the ice isn’t thick enough, he will use the Zamboni to build more ice by flooding the rink with hot water, which helps the bonding process with the rink. The Zamboni will dispense water that is between 140 degrees or 160 degrees onto the ice to make the ice surface smoother and create a stronger bond. However, the ice is kept at 21 degrees on practice days and 19 degrees on game days because of the added body heat the crowd provides inside the arena. Gerrity and the other groundskeepers work around the schedules of both the men’s and women’s ice hockey teams. Jon Terry, assistant director of facilities at Quinnipiac, asks for the practice schedules at the beginning of the year and works around game schedules as well. There is one master calendar inside the arena so the workers know what’s going on at any given time. Zambonis have three main functions: floods, dry shaves (taking ice off the surface) and z-cuts, which removes some ice and puts down some water at the same time. There have been times when coaches ask the groundskeepers to perform a z-cut in the middle of practice to help resurface the ice. The ice can get as low as ¾ of an inch deep, but at the end of the day, the groundskeepers will spend the majority of their time flooding the rink to allow it to build up. It is impossible to see the ice head-on from the Zamboni seat. Alternatively, Gerrity looks down at the ice from the seat and uses visuals on the boards or the ice to navigate. The first go-around on the Zamboni is along the boards. When he drives it along the inner parts of the ice, it becomes easier to tell which parts of the sheet have been cleaned (they look shinier) and which parts are dirty. At that point, Gerrity uses those lines to align the tires and clean the other parts of the ice. On a typical Monday in November, the groundskeepers perform 11 floods, four z-cuts and two dry shaves. In addition, the mechanics that work at the arena check the glass, netting by the nets and the boards to make sure everything is secure. Maintaining and operating the ice is a meticulous process that requires a lot of effort, more so if it can be considered some of the best ice in the country. The TD Bank Sports Center, which opened Jan. 27, 2007, is still relatively new. It isn’t the biggest facility in the Northeast, by far. At 185,000 square feet, it is four times smaller than the TD Garden in Boston. It features two separate arenas: one basketball court and one hockey rink, home to two mid-major basketball teams and two hockey teams. Each side can seat approximately 3,500 people, or about half the Quinnipiac undergraduate population. However, it is a good fit for all sports and people can see the action from any point in each arena. “It’s the best facility in college athletics,” said Jack McDonald, director of athletics and recreation. Quinnipiac hockey started in the 1975-76 season and had not found a consistent home until 2007. Before the TD Bank Sports Center, Quinnipiac ice hockey teams played at Northford Ice Pavilion, which is a 15-minute drive away in Northford, Conn. The Bobcats also played “home” games in East Haven and Cheshire. Hockey rinks have their own distinctions that can create a home-ice advantage. At Quinnipiac, the benches are on opposite sides of the rink compared to being on the same side. The penalty boxes are located on the side of Quinnipiac’s bench, making it a bit easier for the Bobcats to adjust after a power play. The Zamboni comes out of one corner instead of a side of the rink. Oddly enough, Quinnipiac shoots toward the side with the Zamboni doors in the first and third periods each game. When the university planned the TD Bank Sports Center, there were discussions about creating one facility where all four sports can be played. Boston College, McDonald’s alma mater, built the Conte Forum, home to the school’s basketball and ice hockey teams, in 1988. It is considered one of the premier facilities in New England, as it also hosts concerts and graduations. “It’s a busy facility. It’s almost like a small Boston Garden,” said Norm Reid, supervisor of athletic maintenance at Boston College. It seats 8,606 for basketball and 7,884 for hockey, but because it is only one arena, the basketball and hockey teams need to split the time to practice and play, even resorting to other arenas to practice. Both the men’s and women’s hockey teams at Boston College have to practice off campus between 10 and 26 times a year based on the scheduling and use of the arena, Reid said. Women’s basketball and women’s ice hockey weren’t the premier sports they are today, McDonald says, due to the changing times and the advancement of Title IX. On Nov. 15 and 16, Quinnipiac hosted two women’s ice hockey games, two men’s ice hockey games and one men’s basketball game. At Boston College, Reid said it takes approximately two to three hours to complete a changeover between a basketball court to a hockey rink and vice-versa. There are about 30-35 people who assist in the changeover at Boston College, including several union workers and 20-25 students. To change it from hockey to basketball, they remove the Plexiglas around the rink, raise the temperature in the building and put a subfloor down over the ice to help set up the basketball court. Reid said going from basketball to hockey takes a shorter period of time. At Quinnipiac, because ice hockey and basketball play on two separate arenas, there is no need for that changeover. Quinnipiac hosts other events, like concerts and Relay for Life, on the basketball side of The Bank, so the ice doesn’t always need to be replaced. Having to constantly change the arena from a hockey rink to a basketball court or hockey venue is taxing on the ice. “Basically any outside elements that you bring in make it harder,” said Keith Malis, superintendent of building & grounds at York Hill. For more than 30 years, Dave Wescott has worked with ice hockey rinks, focusing on ice management and operations. He has worked at Olympic games and at NHL rinks. He currently works as ice technician for PNC Arena in Raleigh, N.C., home to the NHL’s Carolina Hurricanes. As someone who evaluates hockey rinks across the country for All-Star Arenas, an organization that helps with facility operations, management, ice making and ice painting, Wescott is qualified to evaluate Quinnipiac’s arena. “It’s definitely some of the best,” Wescott said. Wescott has gone to many rinks across the country and also represents Serving The American Rinks (STAR), a national membership organization that focuses on rink management and operational education, as director of facility programs. Wescott comes in to audit the venue to look at the systems, procedures and processes in place and make sure they are properly supervising the ice, according to Terry. Terry, mechanics and groundskeepers take classes to learn how to take care of hockey rinks. The STAR program offers several weeklong classes, including: ice maintenance and equipment operations, which teach people how to use the Zamboni, other equipment and how to be safe on the ice; ice making and painting technologies, which teach people how to properly install the ice on the rink; and basic refrigeration, which helps in making a quality ice surface and utilizing the ice plant. “The ice is a living, breathing thing,” Terry said. There are two layers of piping underneath the slab. Closer to the ice is a subsoil piping system that prevents the ground from getting too cold and creating frost heaves. The second set of pipes is the cooling system, as the pipes refrigerate the slab with glycol, a refrigerant. The subsoil piping, which is known as “heat” piping, prevents the ice from getting too cold, which could cause the cement to crack. The cooling system contains roughly seven miles worth of thin 1- to 3-inch pipes spread all over the arena. “You’re keeping a constant temperature well below the ice surface down into the ground surface, so it’s not getting hot, but not letting it freeze, just maintaining and stabilizing that temperature,” Terry said. Generally, the ice is taken off some time in April. When the ice is off, the Facilities staff clean the surface, tighten the boards from wear and tear and make sure their equipment is up to date. Another way to maintain the arena is by replacing the ice and paint every summer. 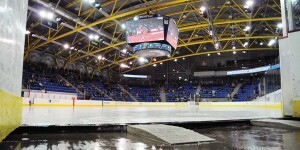 The ice is usually replaced by July, when the university hosts ice hockey summer camps. It typically takes three or four days to paint the ice from scratch and allow people to skate on it. The first day consists of preparing the concrete slab and cooling it to 14 degrees. On the second day, the workers apply four coats of water to the surface and then three coats of white paint, which is a white powder mixed with water to make the ice clearer and whiter, to the surface. To seal the paint, five more coats of water are applied to the ice. Each coat is approximately 180 gallons. Then, the groundskeepers lay out the blue lines, red lines, face-off circles and goalie creases. They use yarn to outline the red and blue lines and then paint inside it. The yarn stays beneath the ice all season long. They use templates to create the face-off circle. After that, the groundskeepers hand-paint the logo at center ice. Four to six groundskeepers work 11 hours starting at 6 a.m. The following day is when the ice needs to build to allow people to skate on it while retaining the format of the rink itself. The groundskeepers will mist roughly a quarter to half an inch worth of water on the ice. At that point, the Zamboni can be used to flood the rink and build the inch to inch and a quarter worth of ice so people can skate on it with minimal harm. Quinnipiac will host the 2014 women’s Frozen Four in March, and portions of the ice will need to be repainted. For instance, Grgurich said there cannot be any in-ice logos and the boards need to be wiped clean. Grgurich used to work for the Hartford Wolfpack, which has ads dispersed on the ice at the XL Center. Two groundskeepers put on their personal protective equipment, consisting of helmets and ice cleats (to prevent them from slipping on the open ice) and bring a bucket of slush, a fire extinguisher and a hockey puck with them. Working hand-in-hand with the referees, they fill in the area with slush, pat it down with the hockey puck to smooth it over and use the extinguisher to create an instant freeze of the ice. Three to five minutes later, play resumes. Two weeks earlier, the referees stop play in the third period. A referee then points for groundskeepers to come out. A piece that holds the glass together falls off. Seconds later, two groundskeepers come out wearing navy blue Quinnipiac hockey jerseys, helmets and ice cleats. They drag a ladder from the corner onto the opposite side of the rink. After about a minute, they walk off to cheers from the crowd of 3,542. Senior forward Connor Jones skates by and says a few words to them. “I joked that they were celebrities out there cause everyone was clapping for them,” Jones said.